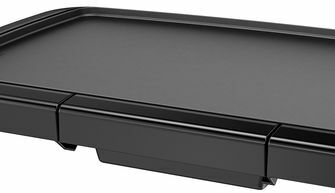 The Black and Decker family size griddle is a great value option to feed a family and have hot food ready for everybody at the same time. With a non-stick 20" by 10" hotplate this Black and Decker griddle can make breakfast for a family, or a batch of pancakes, then unplug from its power cord to be cleaned in the dishwasher or rinsed in soapy water. It's a top-selling model thanks to some great deals on the purchase price. This has resulted in many happy families satisfied with the speed and convenience of their Black and Decker electric griddle. Reading through a significant number of online reviews has highlighted a few design and durability issues, however. Potential buyers should be aware of these to ensure Black & Decker is the right choice for them, and we present an impartial summary of them below. 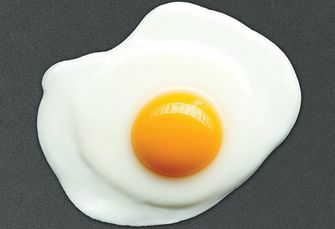 A Teflon coated, 20 by 10 inch smooth grilling surface provides a useful sized area for heating pancakes and eggs, and capable of cooking steak, chicken or burgers. It is slightly sloped towards the front to help excess fat to drain and make a healthier, grease-free meal. This model of Black & Decker griddle produces a 500 watt output from 120V AC power. The power cable is integrated with the temperature control, which is detachable for easy cleaning. 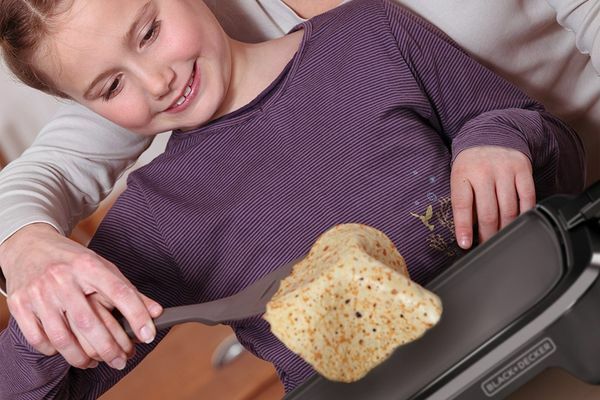 ​The griddle unit can be immersed in soapy water or put in a dishwasher. Any liquid run off collects in a separate drip tray, which can be removed, emptied and cleaned. The rotary temperature control has a scale from 200 to 400 degrees Fahrenheit, plus a Warm setting for gently warming or keeping heat in cooked food. It heats up quickly, although the temperature control should not be relied on for accuracy. The base of the unit gets very hot, and users advise only using it on a heatproof surface such as a stove top if you're grilling for more than a few minutes. The cup for collecting grease and other liquids is not the largest, and soon fills up during cooking. Any more than one batch of bacon and there's a risk it will overflow onto the counter top. ​One design issue is that the drip tray isn't secured and can slide around, spill or even fall out when the griddle is moved. Users report that the tray shatters if dropped on the floor. ​The power cable is short and will require an extension cord unless you are going to be grilling right next to a socket. ​No on/off switch - unplugging is the only way to cut power completely. One user reported that turning the temperature control to minimum left the griddle in warming mode, but with no light, sound or other indication it was still operating. We found the heat distribution was uneven across the cooking surface, with stripy pancakes or hot spots concentrated where the heating elements are located. Preheating for a few minutes before grilling the food seemed to help with more consistent browning. For a budget option, the Black and Decker electric griddle has a strong and stable design. The non stick surface is not the most durable, however, and scratches easily. To get a long life from it will require careful use with no scraping or metal utensils, and gentle soaking cleaning with non-abrasive products. It's a compact 22 x 11 inches, large enough to cook a few pancakes or bacon and eggs to feed three or four but not take over the whole counter top and will store away in or on top of a cupboard. Some buyers could be disappointed with the size of the cooking plate, so make sure 20 by 10 inches is sufficient space for your grilling needs before committing to this model. The Black & Decker electric griddle is a somewhat plasticky appliance without any bells and whistles or any premium non-stick surfaces. It does its job but the temperature control can be inaccurate from the start, and became more unreliable for some users after several months. It's a space saving and rapid way to cook a certain amount of hot food, but the Black & Decker griddle is disadvantaged by a few quality problems and durability doubts that could be avoided by spending a little more on your electric griddle.